The Roman Emperor Maxentius, and attempted to convince him of the moral error in persecuting Christians for not worshipping idols. The emperor arranged for a plethora of the best pagan philosophers and orators to dispute with her, hoping that they would refute her pro-Christian arguments, but Catherine won the debate and succeeded in converting all of them to Christianity, for which the philosophers and orators were executed by an enraged Maxentius. 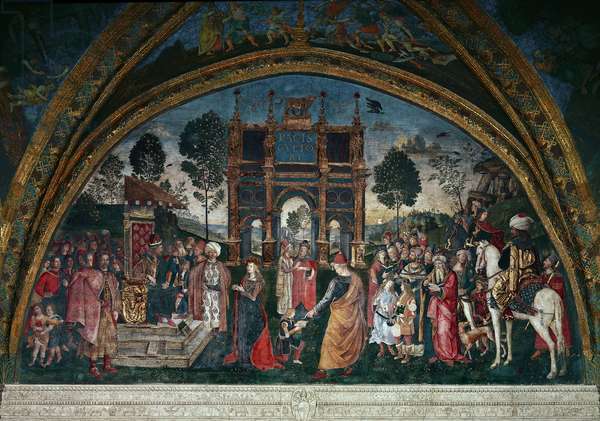 St Catherine is depicted here with the traits of Lucretia Borgia, the Pope's daughter.